Cucumbers are one of those vegetables that people tend to love or hate. My family is mostly filled with cucumber haters but that doesn’t deter me from growing cucumbers every summer. They’re worth growing even if only a couple of us like them. 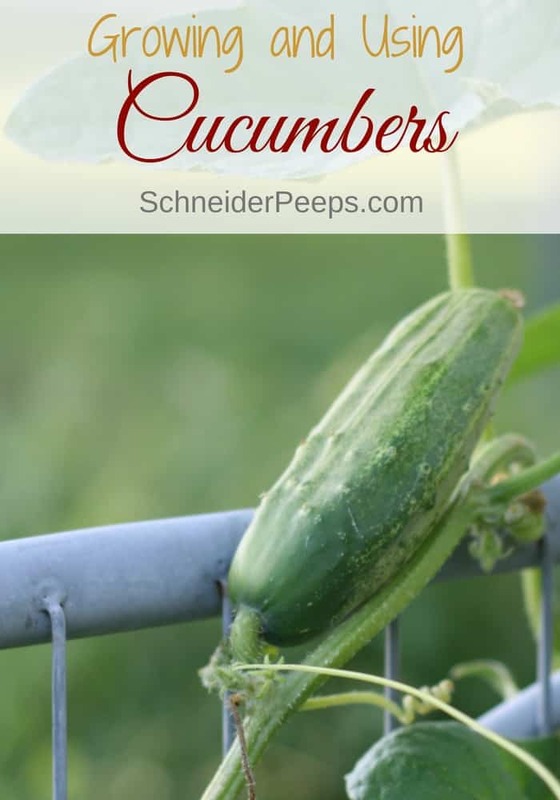 Like zucchini and summer squash, cucumbers can be quite prolific which is great since there are many ways to preserve them for using throughout the year – and I’m not just talking about pickles, you can freeze cucumbers too! Cucumbers are a warm weather plant. In our climate we can direct sow the seeds in mid-March, if you have a short growing season, you’ll want to start seeds indoors first. Even though our growing season is long, I still start seeds and plant transplants because they have a hard time surviving our 100°F temperatures day after day in July and August. I like to succession plant cucumbers by planting a transplant and a few seeds at the same time. This helps spread out the harvest a bit. Cucumbers need warm soil temperatures to germinate so don’t bother sowing seeds if the soil temperature is below 65°F. 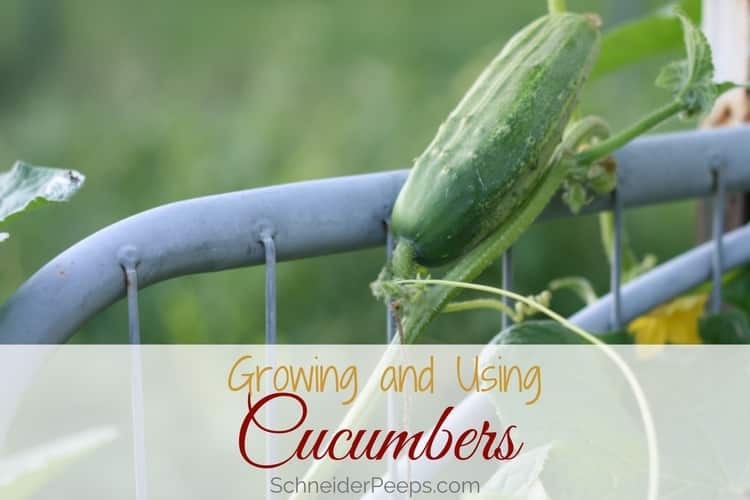 Seeds will germinate in soil temperatures all the way up to 90°F, so if you have a long growing season and can keep them watered, you might be able to get a fall harvest of cucumbers by planting again in August or September. It will take anywhere from 3-10 days for cucumber seeds to germinate. The cooler the soil, the longer it will take. It’s best to grow cucumbers on a trellis of some kind. We’ve been using cattle panels for our trellises lately, but you could use anything you have – a fence, tomato cage, chicken wire and bamboo, or even just twine between stakes. 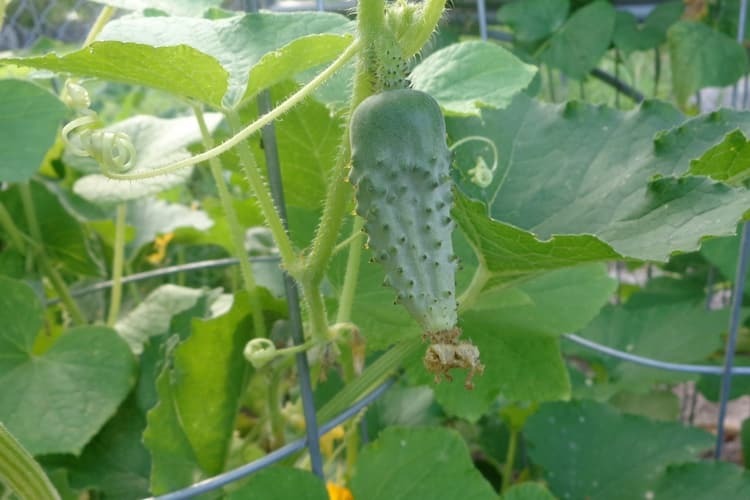 Cucumbers send out tendrils and love to climb, so when you grow them vertically it makes them super easy to harvest. 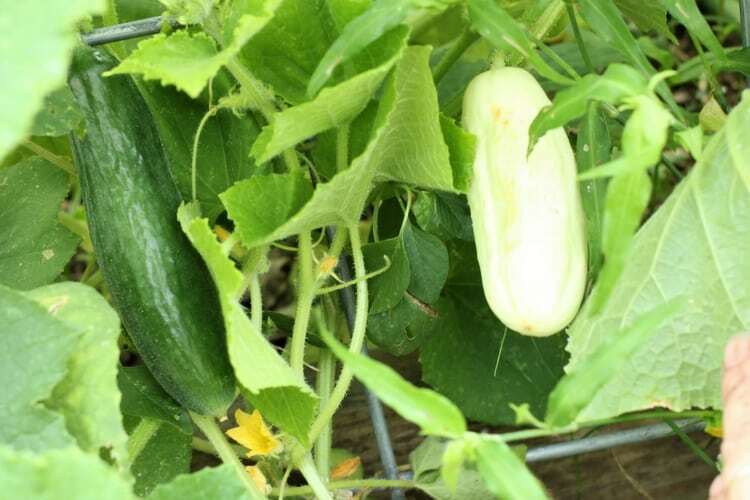 Cucumbers like consistent moisture but not soggy soil, so plant them in well drained soil and water them regularly. Water the soil and not the plant in order to reduce the risk of powdery mildew. If you need help figuring out how many plants you need to feed your family, these printable garden worksheet will help you out. Just fill out the form below and they’ll be emailed to you. Cucumbers are members of the Cucurbitaceae family, commonly known as cucurbits. Other members of this family are zucchini, summer and winter squash, luffa, gourds, and all the melons such as muskmelon, watermelon, and cushaw melons. All the members of this family have similar pests and problems so be careful when you’re planning your garden to rotate where you plant cucurbits and try to use a three to four year rotation. There are some varieties that are resistant to powdery mildew, downy mildew, mosaic virus, and bacterial wilt. Cucumber pests are spotted cucumber beetles and striped cucumber beetles. 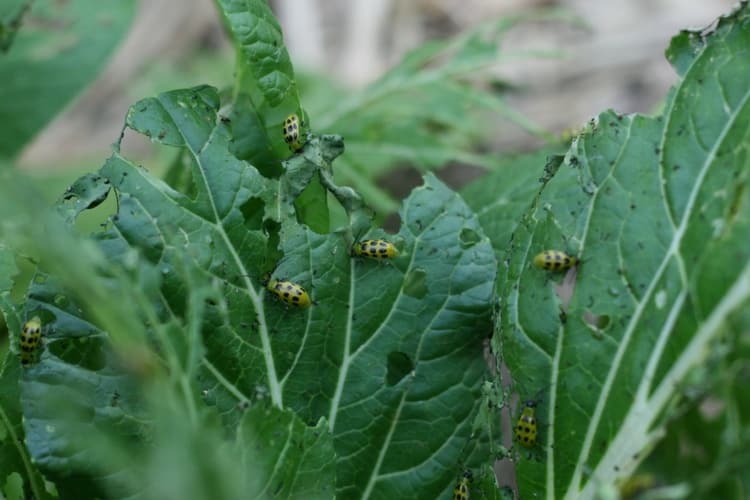 The cucumber beetles in the above photo feasting on the chinese cabbage are spotted cucumber beetles. The adults will eat holes in the leaves, stems, flower, and fruit. Both cucumber beetles can transmit mosaic virus and bacterial wilt. They over winter in garden debris, tall grass, and weeds. In the spring, the spotted cucumber beetle will lay eggs in the soil. When the eggs hatch the larvae will feast on the cucumber roots. The striped cucumber beetle will first eat early spring weed pollen, then lay eggs in the soil. When the eggs hatch the larvae will feast on the cucumber roots. Many people find floating row covers helpful in deterring cucumber beetles. If you use floating row covers you’ll need to remove the covers some during the day so bees can get in to pollinate the cucumbers. Or you can remove the covers and hand pollinate the flowers using a small (clean) paintbrush. When you clean up your garden at the end of the season, burn any diseased or pest infected plants – don’t compost them. When it’s time to harvest cucumbers will depend on what variety you plant and what you’re going to do with them. There are some “pickling” varieties that are bumpy and are best picked small. Then there are varieties that are for eating fresh, their skin is smoother, and they can be picked when they reach about 7 to 10 inches. These are called slicing cucumbers. Because there are only a few of us that like cucumbers in my family I plant the larger, slicing variety and then just pick them when they are small for pickling. It works for me instead of trying to grow a couple of different varieties, although I’ll sometimes grow fun varieties such as white cucumbers just for fun. Cucumbers will store for several days in the refrigerator, so if you want to make pickles or ferments you can harvest them over a few days and make a big batch if that’s what you like to do. If you let them get too big the skin will thicken and the seeds will get pretty big. I either give these to the chickens or peel and deseed them, cut the remains up small and make relish with them. Most people think the only ways to preserve cucumbers is to pickle or ferment them. 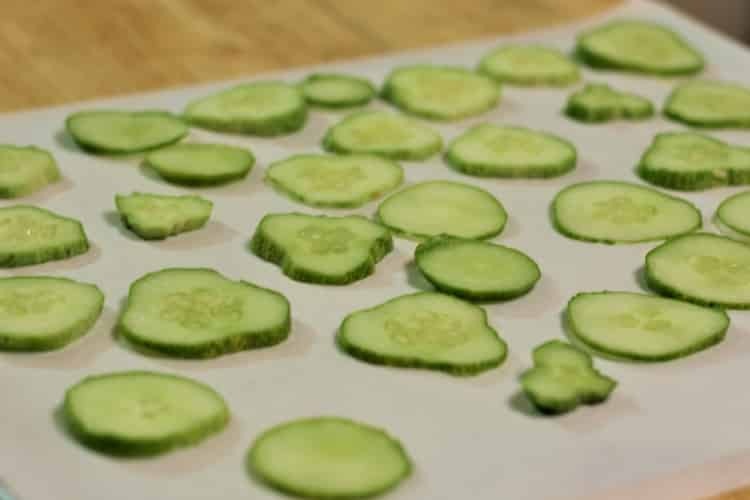 But you can also dehydrate or freeze cucumbers. We prefer to eat cucumbers fresh, but once we get more than we can eat fresh each day I’ll make pickles and ferments for those of us how like them. After that is done, I’ll dehydrate and freeze enough to last a year to use to infuse water. You can also preserve cucumbers by making cucumber mint jam or cucumber picante salsa. Hi Rebecca, as far as I know that only safe way to can cucumbers is in vinegar – enough to pickle them. If you really want to try to preserve the cucumber salsa, you might try making a small batch and freezing it for a few days. Then pull it out, let it thaw, and try it. The texture of cucumbers changes when it’s frozen so you might not like it frozen. Let me know how it turns out.